But getting closer to done. 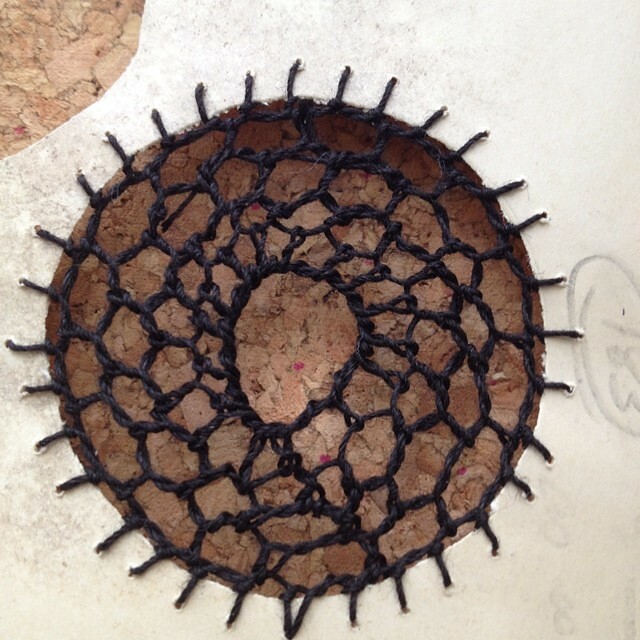 I am still considering if any other thread bits need to be added; and most importantly, thinking about how to finish the piece. I normally mat things on black, but that won’t work for this piece. And the white I have on hand looks too stark. So, I’ll keep experimenting. I know I said that I didn’t see much Hedebo in my future, but I had it in my head that I was going to do it on paper. 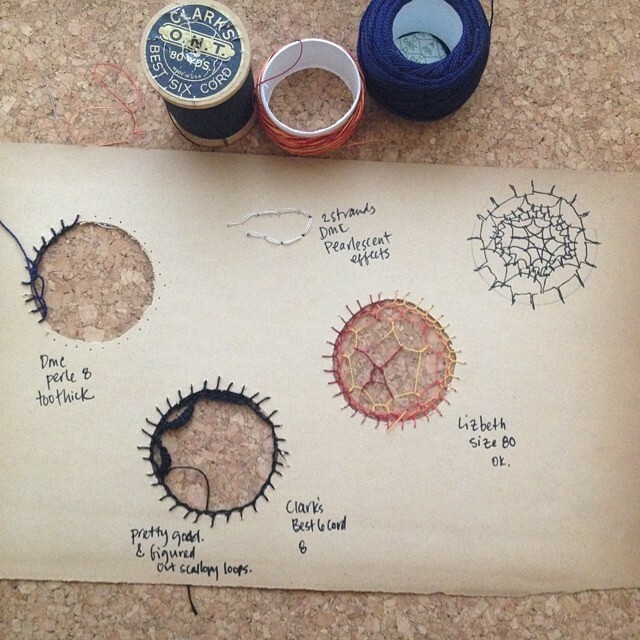 So I tested out some different threads — perle cotton, vintage Coats and Clark, and tatting threads. And settled on the vintage Coats and Clark. I’m not sure it will work out entirely in the end, but I’m going to give it a really good try. I have to say, it feels good to have an idea percolating. I’ve been feeling lazy lately. But it’s probably because I’ve had too much happening in my work-life. Someone please remind me that making things keeps me sane; every once in a while I seem to forget. 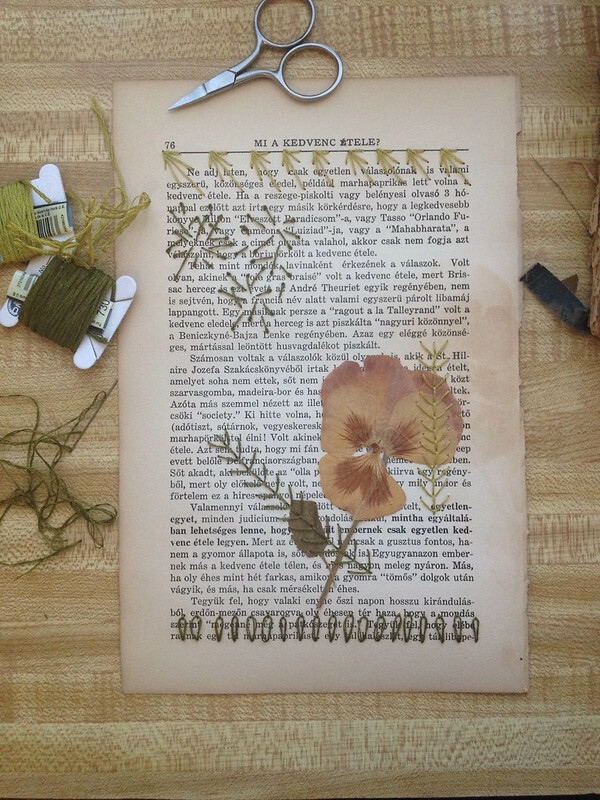 While I haven’t had the time to dive into Hedebo just yet — I’m still adjusting to the kids’ new summer schedule, and work is particularly busy — I have made a little time to sit down with some paper and thread and play. I’m working on another improvised little patchwork piece. This one is four little squares, arranged with raw ends towards the middle. 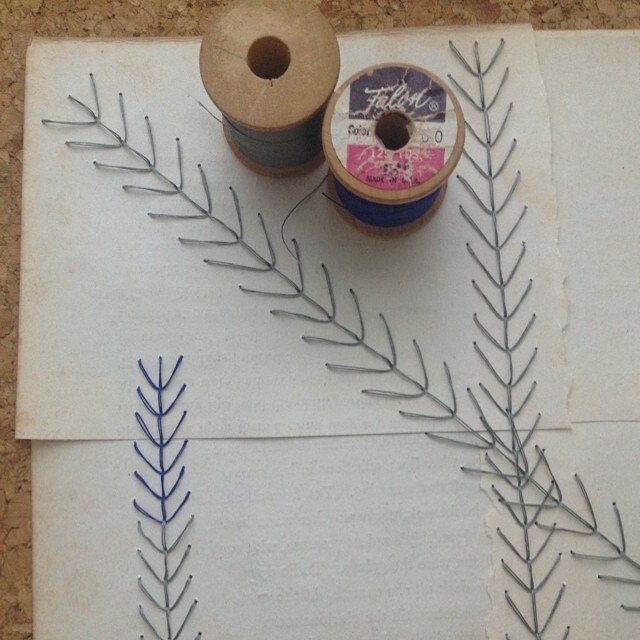 So far, I have just added a little fern stitch here and there to hold the pages together. This time trying to venture out of my usual one-color palette with a little pop of blue. This Memorial Day weekend, we don’t have any big plans. We had some family to visit yesterday afternoon but, that’s it. No parties, no softball games, no running the kids around. Nothing but free time. 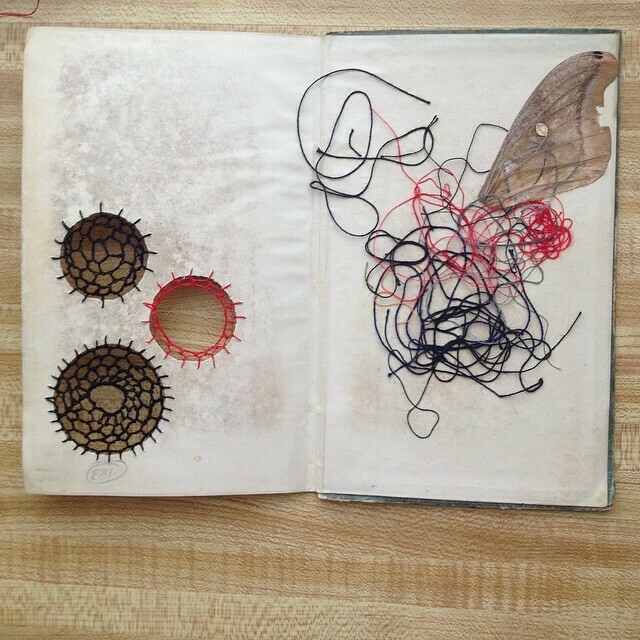 It took me a little bit to work up the nerve — this flower was inside this Hungarian cookbook (and on this page, even). Once I stuck it down (I use these scrapbooking adhesive squares) I just sucked it up and went for it. It’s very much not close to done, but I’m happy with how it’s going so far, particularly the bits around and over the flower. 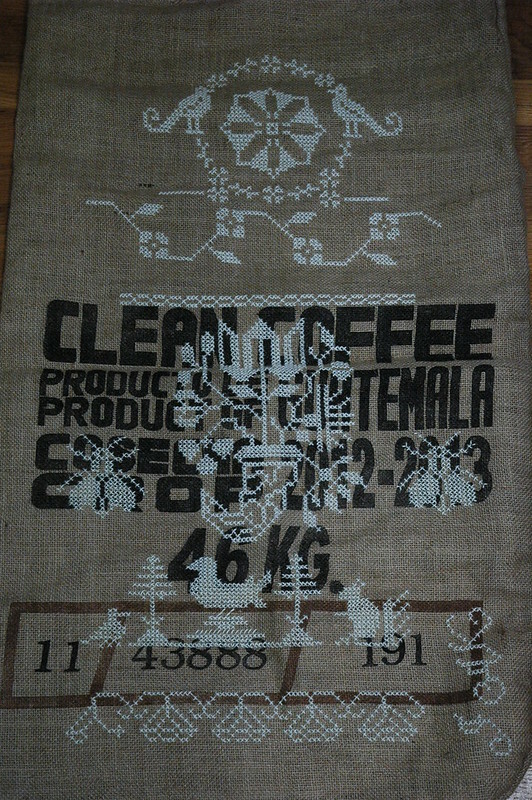 I’ve been slowly working on adding things to the burlap coffee bag. I am pretty sure that this side will be done once I finish up the flower in the bottom left hand corner. Then, I will move to the other side. This project has been pretty satisfying. Working big like this — I’ve been stitching over 2 using size 3 crochet thread in natural, and with a big plastic kid’s needle — has made for pretty quick progress. And as I am always obsessing over tiny flaws in my work, improving and not being overly worried about everything being perfect has been really liberating and a very good exercise for me. I think the only thing I would have done differently on this side would be to start from the bottom and work up, instead of going from the top down.